Everyone wants a getaway once in a while to escape! 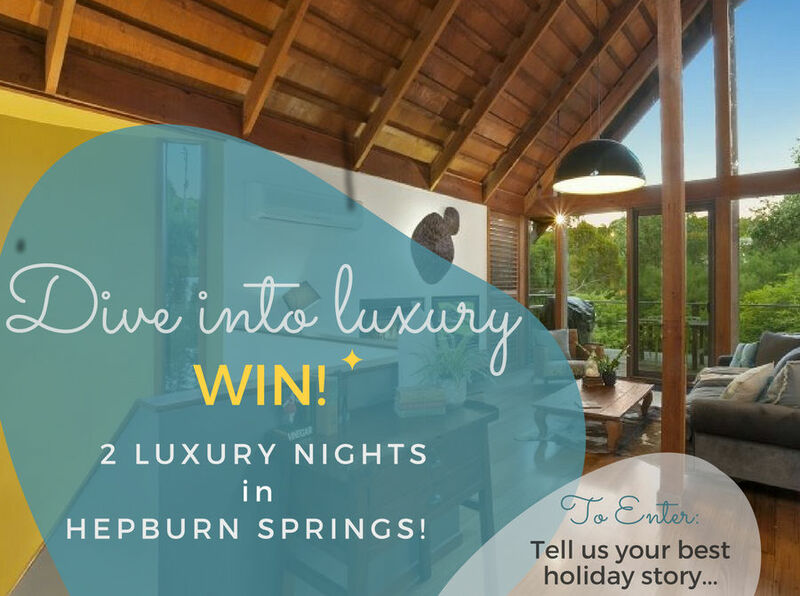 We’re giving a couple or two friends a chance to win a mid week getaway, staying two nights in our 5-star Hepburn Springs luxury accommodation. Comment on our Facebook post by telling us about a standout holiday escape you’ve had and what made it great. Like our Facebook page (of course)! And (only if you want to) share the post so that other people can enter. One winner will be announced on Monday 14th August 2017 and will be notified via Facebook. The winner receives two consecutive nights accommodation (on a Monday, Tuesday, Wednesday or Thursday only) at the property of their choice – either Saffron, Horizon or Kookaburra Ridge – all Hepburn Springs luxury accommodation. Winners can only book accommodation for days between 9 October and 21 December 2017 (inclusive). Tuesday 7 November (Melbourne Cup Day) is not included. Dates are subject to availability at the time of booking. Hepburn Spa Pavilions is located in the heart of Victoria’s Spa country in Hepburn Springs. Since the 1850s, people have been arriving in Hepburn Springs to experience the natural healing waters of the famous springs. Today visitors come to Hepburn Springs and Daylesford for its natural beauty, for romance and for pampering, enjoying wineries, restaurants, art and culture. Hepburn Spa Pavilions is located in the heart of Hepburn Springs, overlooking the historic mineral waters and bathhouse. Accommodation includes two architect designed villas, with hydro spa and luxury linen or an antique-filled country house on two acres of landscaped European gardens. Winners will be required to provide a $250 security deposit via credit card as a security bond, prior to their stay and payable at the time of booking. The full bond will be returned within 7 – 8 days from the end of the stay. Winners can only stay between 9 October 2017 and 21 December 2017. Dates are subject to availability at the time of booking. We encourage the winner/s to book as soon as possible after being notified of their win, to avoid disappointment. Hepburn Spa Pavilions takes no responsibility for dates not being available. Hepburn Spa Pavilions is not obligated to provide accommodation outside the current terms, if the available dates do not suit. Bookings can only be made (subject to availability) for Monday, Tuesday, Wednesday or Thursday nights. Friday, Saturday and Sunday and public holidays are not included. Hepburn Spa Pavilions reserves the right to cancel or change the conditions of the competition or withdraw the prize at any time. If you have a question, please ask us via our contact form.